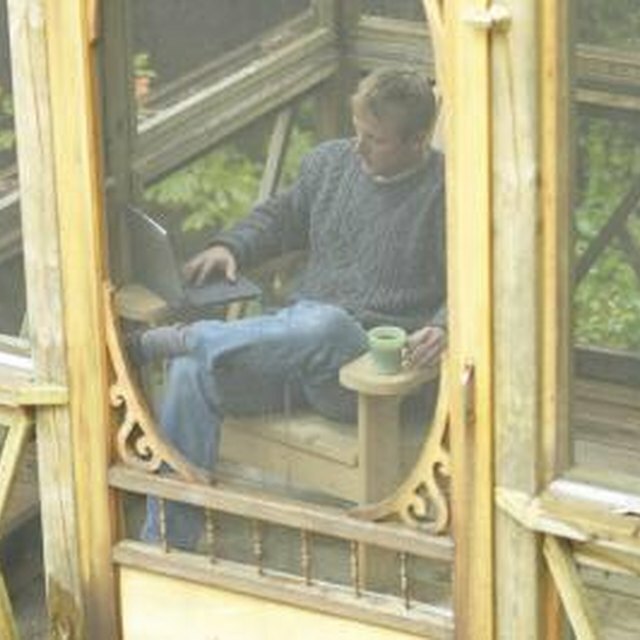 A gazebo made from tree limbs will act as a rustic focal point for your yard or garden. Whether you choose to build one yourself or purchase one already made, consider how you will be using the gazebo to determine the size you require. The gazebo can be made entirely with twigs and branches, or you can incorporate heavier posts for stability and then cover the posts with decorative branches. Experiment with the sizes of branches and twigs. Basic gazebo designs incorporate the use of four posts and a roof of some sort. Try using heavier limbs to act as posts for the gazebo. Connect the posts with a series of branches to enclose one or more sides and cap it with a thatched roof made from the thinnest twigs. You can also design a larger-scale gazebo with a pentagonal shape or an octagonal design. Larger designs can accommodate built-in seating on one or more sides. You could also install a rustic table in the middle of the gazebo and place wrought iron chairs around it for rustic garden entertaining. While tree limbs, branches and twigs are the main materials required for a gazebo, there are other materials to consider. For instance, the flooring needs to be something smooth to avoid tripping. To keep in line with the rustic style of the gazebo, look for reclaimed fence slats with rustic appeal. You can also design the gazebo to rest on top of a stone patio area. Stones such as slate, flagstone and reclaimed bricks will work well for this type of application. Consider also what type of roof you will add to the structure. Reclaimed fence slats, thatched branches and shingles are all options. Dress up the tree limb gazebo with a few carefully selected accessories. One idea is to hang flowing white curtains on one or more sides of the gazebo. Not only will this dress up the gazebo, it will also provide privacy. For seating inside the gazebo, add cushions and [throw pillows](https://society6com/pillows?utm_source=SFGHG&utm_medium=referral&utm_campaign=4433) in colors found elsewhere in the garden. If your garden is primarily green, look to soft, sky-toned blues, but for gardens with pops of red and jolts of orange, incorporate vibrant colors into the color scheme. Blend the rustic gazebo into the existing design of your yard by incorporating other rustic elements. While you don't want everything to match absolutely, the addition of a tree limb bench in the front yard will unify the space as a whole. Other ideas include a freestanding trellis made with twigs, a rustic gate made from branches with a similar design to the gazebo and an arbor above a bench. You can also build a rustic porch swing and dress it with the same cushions used in the gazebo.